Fuel tank, large neck standard type. Philipino manufacture. These tanks funtion fine but are constucted differently than the original units. 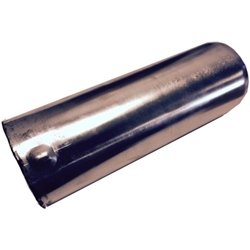 See our other tank listing for our tanks which are manufactured per originals. Sleeve, fuel tank extension with pre filter. These are standard with all WWII large neck fuel tanks and often go missing. These are high quality repros.